If we’ve learned anything from our wired world of late, it’s that we’re all pretty much addicted to our screens and we’re also fairly powerless to do anything about it. Okay, that’s a little dramatic, but it’s pretty close to the truth when you consider that it’s engineered to grab your attention, keep you hooked, and make you crave more. 2.5 billion people now use at least one of Facebook’s apps. As of the latest studies, approximately two-thirds of adults in the United States are active Facebook users, and of those people, three-quarters of them check the social network every day, according to a recent report from Pew Research Center. In a separate Pew survey with teens, results show “screenagers” are on social apps even more often, with nearly half of 13 to 18-year-olds saying they check in “almost constantly.” Those kinds of statistics, especially among teens, fuel concerns that extended screen time could be linked to ADHD, sleep deprivation and depression. CAN NEW TECH TOOLS FIX OUR ADDICTION TO IT? Facebook’s the latest big tech company to offer up new ways to curb our addiction to their products. Just today, it launched a suite of tools to help people better manage time on Facebook and Instagram. It includes an activity dashboard that shows you how much time you spend on the apps each day and over the course of one week, a way to set a daily reminder not to exceed a certain amount of time and a new way to limit distracting notifications that you get throughout the day. “Our hope is that these tools give people more control over the time they spend on our platforms and also foster conversations between parents and teens about the online habits that are right for them,” Ameet Ranadive, Product Management Director at Instagram said in a statement. The company also explained that new tools are — at least in part — in response to the outcry over tech addiction among adults and teens. On that note, I was able to beta-test an early version with my 17-year old daughter, Jeneva. She’s a big Instagrammer (she says Facebook is only for grandparents now…) so we were both cringing before we took a look at her statistics for the very first time. 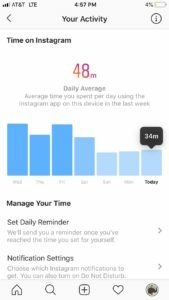 To access the tools on Instagram, go to your Settings then tap “Your Activity,” (For Facebook, start at your setting and then go to “Your Time on Facebook.”) From there, you’ll see a dashboard showing your average time for that app on that device. “I honestly thought that I spend a lot more time on Instagram than I do,” Jeneva said the first time we checked. “I’m pretty surprised, in a good way.” I was too. According to Instagram’s new tool, Jeneva spent just under one hour per day on Instagram the first week we tried it out and was already down to less than 45 minutes per day the second week. She says just being aware of the time helped her cut back right away. It’s true, whenever I see her staring at her phone for what I deem as “too long,” I comment on it. Conversely, she does the same for me. She also admits that she splits her online “down” time pretty evenly between Instagram, Snapchat, and Netflix. With all three she’s closer to two hours a day total “passive” screen time. While that’s still below the national average — she admits she has to work at it — and reminds me that I do too. “We have rules and boundaries in our house, and I think that’s a good thing” she confesses. “We’re not on devices at dinner, and we make sure to pay attention to each other and take time to talk and go outside, and just do family time.” She also admits having a tech tool to remind her when enough’s enough is better than a nagging parent. There’s the other thought here too. While my daughter’s time spent on Instagram is less than we thought, it’s still an eye-opening number. Even at just under an hour per day, that’s still nearly seven hours per week, which is almost a full workday for many people. Along with the check-when-you-want activity stats, Facebook added a couple of other features that will help all of us manage our time a bit more wisely too. 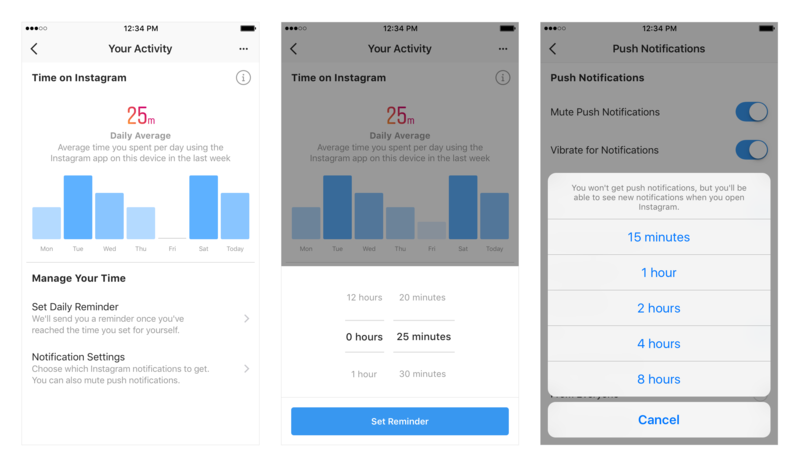 Both Facebook and Instagram now let you set time limits that will alert you whenever you reach a certain threshold — like one hour per day, for example. A notification will let you know when you’ve hit your limit, and even though you can mute or just totally ignore it, it’s a great tool for self-checking your social network addiction. When I ask Jeneva if she thinks social media sites need more management tools like these, she said absolutely. Self-policing, and just making people aware of how much time they’re spending lost down social media rabbit hole, seems to be a good first step, but she would like to see them do more. As I mentioned before, Facebook is just the latest company to offer tools to prevent tech overload. In its upcoming iOS 12 update, Apple is adding a new tool called Screen Time that shows you exactly how much time you’re spending on your smartphone, and what you’re doing while you’re using it. The feature allows you to set time limits for specific apps and will tell you when you’ve reached your limit, a lot like what Facebook is launching today.